Youngstown has gone from boom steel town, to a down and out city that is now half the size in population that it was in its hey-day of glamour, to a town with a bright future. The orange tinted night sky of blast furnaces has gone forever, but the city is no longer looking back on what it used to be, and is today looking forward to what it can be. Youngstown is literally tearing down its past ties through demolition of abandoned buildings, making room for the future. The downtown area that once drew crowds to theaters and shopping is now being renovated with new construction. 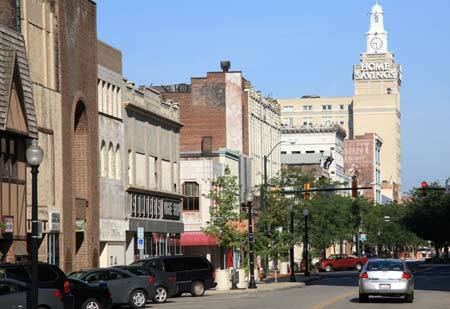 Youngstown is making bold attempts to shed its image as a "rust belt" city and today it is well on its way at becoming a vibrant city with demonstrable pride showing in its citizenship. 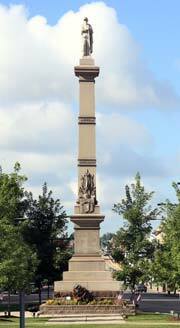 Youngstown was named for New York native John Young, who surveyed the area in 1796 and settled there soon after and the city was incorporated in 1867. John Young purchased about 15,000 acres for just over $16,000 in 1797 from the United States Government through the Connecticut Western Reserve Land Company. By 1798 more families were settling in the Mahoning Valley between the Mahoning River and Mill Creek Park. Iron ore and coal deposits had been discovered near Youngstown, and an early iron industry flourished and in 1802 Daniel and James Heaton built the Hopewell Furnace. By 1820, Youngstown's population had begun to grow along with industrialization and the opening of the Pennsylvania and Ohio Canal. This canal connected to the Ohio and Erie Canal and although the canal was abandoned in 1872 like many of Ohio's canal systems, it played an important role in getting products to market. As railroads became more economically feasible, they also attracted more people and industries to Youngstown. In 1877 the canal was officially closed and the property sold mostly to the railroad. In 1876, the Mahoning County Seat was moved from Canfield to Youngstown. This secured Youngstown as a viable metro area and by 1890 the city's population had grown to over 33,000. Like numerous areas in Ohio, iron was being produced where raw materials and fuel were plentiful. With the invention of steel, many of those areas failed for the lack of materials required to make the stronger metal. Youngstown was fortunate in that it had all of those ingredients. The first steel company was established in the Mahoning Valley, changing Youngstown industry from iron to steel which was the forerunner of miles of steel plants in the valley. By the 1920s, Youngstown was second only to Pittsburgh in terms of total steel production in the United States. At the same time, the industry faced difficult challenges. After the closing of the canal, the city no longer had access to water transportation. In addition, there was a shortage of water for use in the mills. In spite of these problems, the city continued to grow. The population in 1920 was over 132,000 and Youngstown was ranked as the 50th largest city in the nation and in 1930 the population reached its peak at just over 170,000 residents. With the entire country suffering the effects of the Great Depression, Youngstown was hit even harder. With the city's economy relying so much on steel industry, its unemployment rate was 3 times the national average at this time. Unions were gaining popularity, but several steel companies in Youngstown had resisted unionization. They were collectively known as the Little Steel Companies. Workers at these mills went on strike on March 26, 1937. Although the "Little Steel" strike, as it became known, was not successful in the short-term, it led to the creation of the Congress of Industrial Organizations, commonly known as the CIO. The CIO was able to force the Little Steel Companies to accept unionization in 1941. Demand for increased steel production during World War II made Youngstown's industries once again important contributors to the American war effort. Prosperity returned to the city. After the war, the automobile industry continued the demand for steel and with it, Youngstown's economy continued to grow. In the late 20th Century however, this economic growth slowed, as the entire steel industry across the United States began to decline. Cities such as Pittsburgh and Youngstown became part of the "Rust Belt" during this era. Youngstown's population also decreased. According to the 2000 census, the city had 82,026 residents. The Youngstown Historical Center of Industry and Labor, built in 1986, houses the exhibit “By the Sweat of Their Brow: Forging the Steel Valley” which shows the impact of the iron and steel industry in the Youngstown area. Today, new industries are emerging in Youngstown and the city is seeing an economic revitalization that only a few years before would have seemed impossible. The 2006 census placed Youngstown's population at 83,906. Extensive coverage of Youngstown's economic challenges has overshadowed the city's long entrepreneurial tradition. A number of products and enterprises first introduced in Youngstown later became national household names. Among these is Youngstown-based Schwebel's Bakery. The company now distributes bread products nationwide. Youngstown's cityscape includes what seems to be few contemporary buildings, and for the most part, the downtown area appears to have changed little since the early 60s. Yet, downtown Youngstown has seen modest levels of new construction. Recent additions include the George Voinovich Government Center along with other state and federal courthouses including the Seventh District Court of Appeals and the Nathaniel R. Jones Federal Building and the U.S. 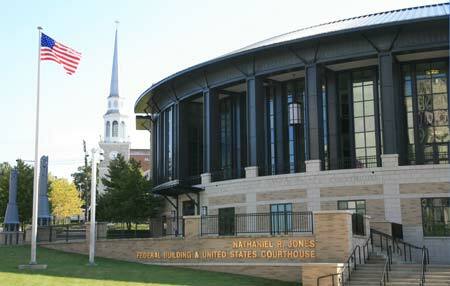 Courthouse. The latter features an award-winning design by the architectural firm, Robert A. M. Stern Architects. In line with these efforts to change the community's image, the city government, in partnership with the university, has organized an ambitious urban renewal plan titled Youngstown 2010. The stated goals of Youngstown 2010 include the creation of a "cleaner, greener, and better planned and organized Youngstown". In January 2005, the organization unveiled its "master plan", which took shape in the course of several public meetings that featured input from citizens. The plan, which received national attention, is consistent with efforts in other metropolitan areas to address the phenomenon of urban depopulation. Mill Creek Park was established in 1891 as the principal property of the Youngstown Township Park District, now the Mill Creek Metropolitan Park District. The Park District serves the Mahoning County residents, and welcomes visitors from across the nation and around the world. The Mill Creek Metropolitan Park District preserves open spaces within the urbanized Mahoning Valley. Mill Creek Park covers 2,530 acres and includes 21 miles of scenic drives and 15 miles of foot trails, and a rare collection of gardens, streams, lakes, woodlands, meadows and wildlife for all to enjoy. Visitors will find a wide range of recreational opportunities such as hiking, biking, picnicking, boating, Par-3, or championship golf, tennis, sand volleyball and more. Many of the facilities can be found at the James L. Wick, Jr. Recreation Area. Universally accessible trails, fishing pier, playground and picnic areas are located throughout the Park. Cabins and pavilions for group events are available for rental year-round. The Youngstown 2010 Vision is a guiding document that sets out a framework for understanding and addressing the issues that Youngstown faces. It provides a community-based agenda for positive change. Realizing that big steel will not be returning to the area, the community is focusing on how best to address maintaining and improving the economic outlook for the city. Small businesses account for most of the jobs created in today’s economy. Part of that plan is to help these small businesses take shape and develop in the Youngstown area. The Youngstown Business Incubator helps new technology firms and it is expanding – it’s an example of a step in the right direction.